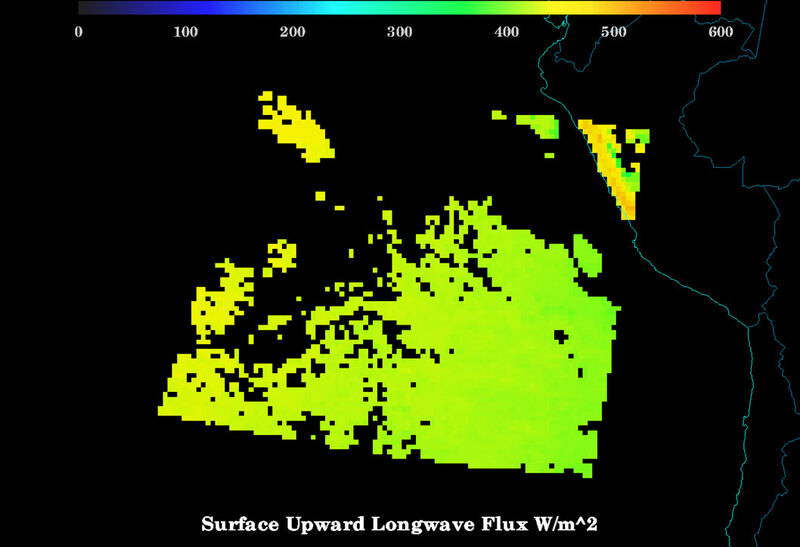 Example of the surface upward longwave radiation (W/m**2) product as generated by the GOES-R upward longwave radiation algorithm for Terra MODIS on August 24, 2006, at 16:10 UTC. The surface upward longwave radiation (ULR) algorithm generates the upward component of the thermal infrared radiative flux at the Earth’s surface. This product will be computed at each clear ABI pixel and will be derived by using data provided from the GOES-R ABI atmospheric profile (temperature and moisture) and surface temperature products. The ULR product will provide one of the four critical components of the Earth’s surface energy budget which is an important factor in determining the temperature fields at the surface and greatly affects the oceanic and atmospheric circulations. The other three components are the downward longwave radiation, the incoming solar radiation (insolation) and the reflected solar radiation. Information from the ULR product will provide more accurate data to be used in climate prediction models.